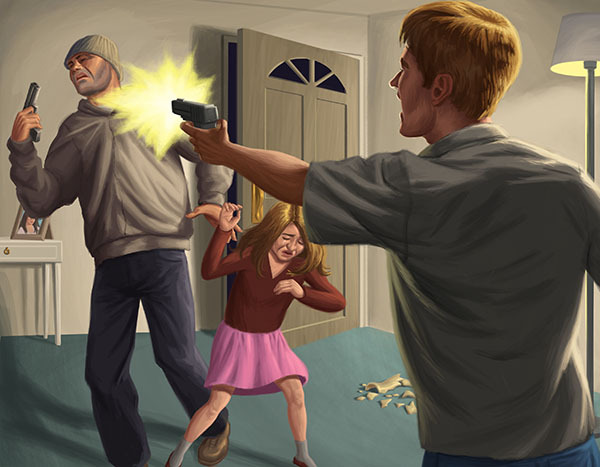 Here is my most recent illustration for Combat Handguns Magazine, for the “It Happened To Me” August 2014 issue. It Happened To Me is a monthly segment of the magazine that publishes real-life stories of individuals who defended themselves from criminal and violent acts. This particular story is about a man repelling a home invasion robbery that occurred at his house. Please click the link to read the whole story. Roger Betka is an Illustrator based out of Los Angeles, California, and has a highly eclectic interest in retro art and Science Fiction. My personal artistic style merges classic c… Show more. Send a message directly to Roger Betka. “"I would like to give a shout out to Roger Betka, he just finish my band's EP artwork, and he went above and beyond. He was always punctual about responding, and very easy to talk to. He even gave it to me before the deadline. 5 stars easily. Would highly recommend." Roger Betka is an Illustrator based out of Los Angeles, California, and has a highly eclectic interest in retro art and Science Fiction. My personal artistic style merges classic comics, science fiction, underground & retro art together. My experience spans from comics, story boarding, and caricature art to commissioned oil paintings for distinguished patrons. I currently work as a freelance Storyboard Artist with Storyboards Online/ Interactive Art Services Inc. I have produced Storyboards for several major TV Commercial campaigns for companies such as Ebay, Reebok, Chevy Motors, Baskin Robbins and others.